Ugh. Last night was a looooong one! Mike tried getting Reagan to sleep in her bed but she was NOT having it. 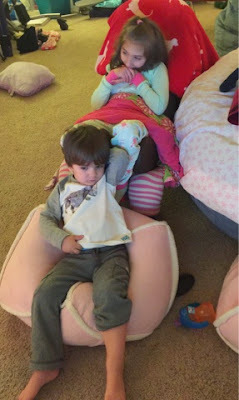 He eventually transferred her to her chair and we gave her medicine hoping to get her to sleep. Unfortunately, it didn't work (nothing worked). Reagan was super moany and just not wanting to sleep! I was up and down with her all night long. She would calm down or even doze off a little when I was sitting beside her, but as soon as I would get up and try to go back to sleep, she'd start up again. She was pretty miserable the whole night. Lots of moaning. Today, she's been super tense and crunchy (and lots of teeth grinding and lip biting). She was very high need and vocal about it, but she was OK as long as I was holding her. Otherwise, she was on the verge of tears at any moment. It's hard to tell if this was just a mild bad day or a rotten good day (her just trying her best to not go into a bad day). Either way it was not a fun one. And of course, still no weekend nurse. On a good note, we do have a nurse filling in tomorrow and Monday, so at least we'll have some help. 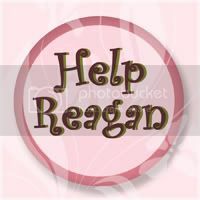 Tonight I'm just really hoping and praying Reagan will sleep (so we all can)! Even asleep she's tense and biting her lip! Poor thing! Reagan slept well last night and was still pretty sleepy today. 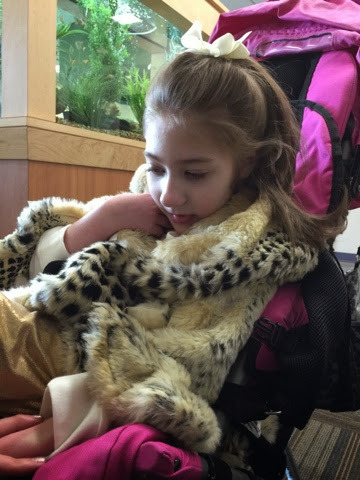 Thankfully, no therapies today so she was able to take it easy all morning. She slept off and on, but when she was awake, she was kooky/crunchy! It's all or nothing with this girl! Earlier in the week she was so loosey goosey and super calm, now she's super tense in her body and at her hands nonstop and vocalizing like she's just about to lose it! She woke up just in time to get into her AFOs and on her bike so the tech who was replacing the pedals could make sure she was positioned correctly. 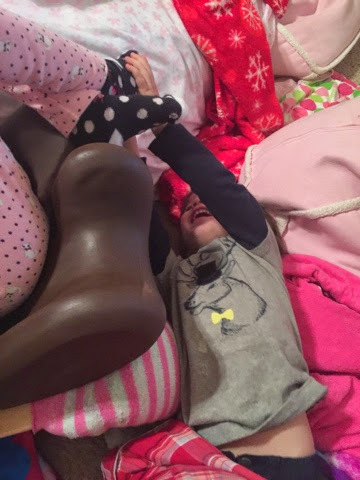 She did OK until right as we were getting her out...then she started freaking out! We were able to get her out quickly and comfortable and she settled back down. It had been a while since her last poo, so I really think that was playing a role in her discomfort. Even tonight she was tense and vocal, but she seemed to do better with me holding her. Hoping she can get some sleep tonight! Reagan slept well last night and we found her this morning rolled completely over onto her tummy. She made a little fuss and both Mike and I ran in there, but her eyes were still closed and she was still asleep. She slept a little while longer and then woke up for a bit, just long enough to get her clothes and diaper changed and then dozed right back off again and slept the entire day. During the day she never woke for longer than a few minutes at a time, at which point she'd be super crunchy and wanting to bite on her hand. She'd stay awake long enough to have her diaper changed and then she'd be out again. Tonight she did wake up for about an hour or so. She wasn't fussy, but she was a little vocal and still very crunchy and wanting her hand in her mouth. She eventually dozed back off on her own and we transfered her to her bed without a hitch. Hoping she wakes up feeling rested and instead of crazy! It's been another calm one! 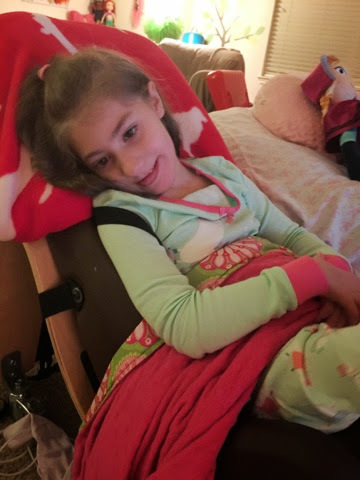 Reagan slept well and was still but awake and smiling when we checked on her this morning. She's had a super busy day of therapies. This morning she was very groggy...she was awake for speech but just barely! Then PT came and woke her up a little with some stretching, but she was still pretty groggy. 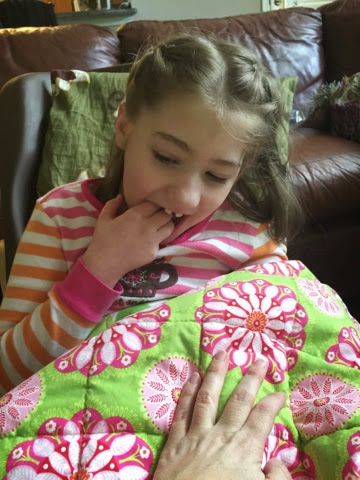 This afternoon she had private OT and then school & OT! She really did well considering she had so many things crammed into an already groggy sort of day! She did get a little over excited once during school (the Grandma bunny started playing and she started laughing/smiling but once activated it plays for a while and she almost lost it)! She regained her composure though and was fine. She actually was dozing off afterward. Busy day, I don't blame her! 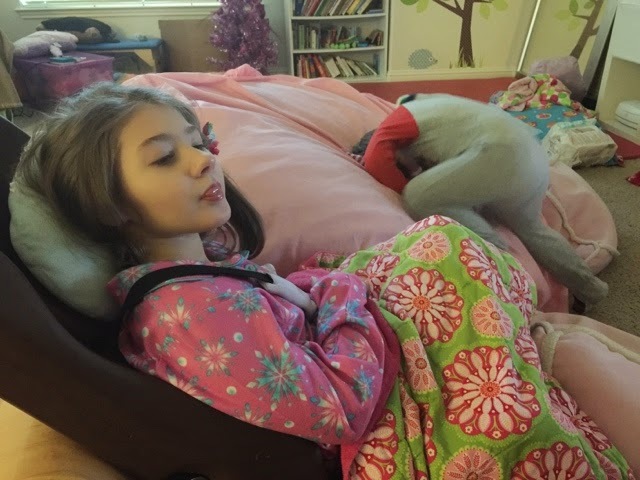 She fell asleep in her bean bag chair before her nurse left for the day and then she just kept sleeping! 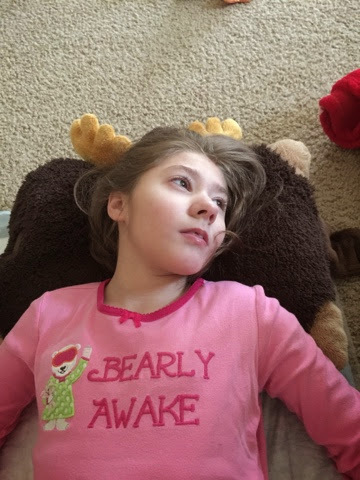 There was one moment, around 9:30pm or so, when she woke up, opened her eyes, acted a little stressed and vocal and then dozed right back off. She didn't even wake up when we moved her to her bed and changed her diaper! Sweet girl! Hoping she gets the rest she needs! Reagan slept well last night and has been super sweet and calm again today. No therapies this morning so that gave her extra time to take it easy. This afternoon she had both OT and school/vision. She did well with both, but she was pretty groggy. 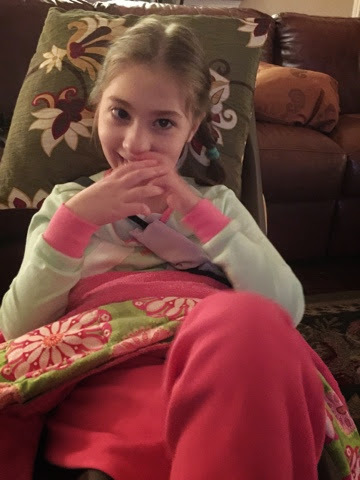 After school we decided to seize the day and give her a Jamberry pedicure since she was so calm and still! 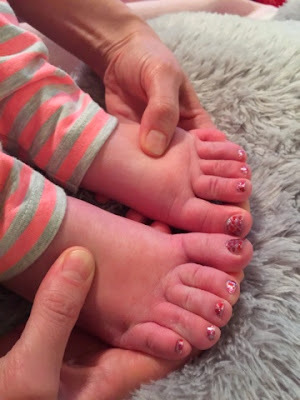 It's not easy with those tiny little toe nails, but we got the job done and it looks SUPER cute! Tonight Reagan was so super cuddly and sweet...loving these laid back easy going days for my girl! Everyone slept in this morning...well, everyone except Daddy! We all got up a little after 8. 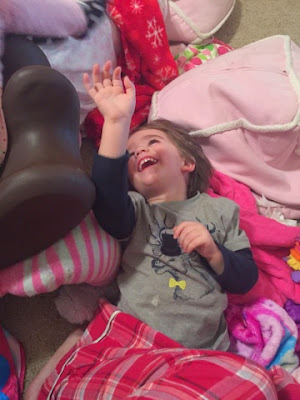 Reagan was laying in her bed, completely still, arms up above her head, but eyes wide open! And that's how she's been all day. Very laid back and calm. Not a lot of movement. Arms down by her side and only in her mouth on occasion (instead of nonstop). Very still. Very chill, but sweet. A little spitty and doing some licky mouth movements, but I think that may be related to the decreased tone. She had speech this morning and despite wanting to doze off when she got here, she did really well making choices! PT came shortly thereafter and Reagan was still pretty groggy and wanting to doze off. Her therapist was able to get in some good stretching though, so that's good. The rest of the day we just hung out. No nurse today so she spent a lot of time around crazy brother but didn't seem to mind. 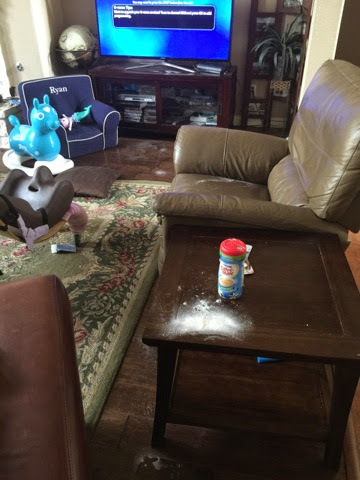 Notice the trail of creamer from the floor to the tv! it's all up his nose and in his eye! It's been another good day for my girl. She's been sweet and relaxed all day. Definitely less serious and more easy going. We're getting more laughs out of her which is great. Another take it easy sort of day. I really want to get some pictures taken of her and her brother again. We had some done when we first moved here a year and a half ago, but haven't had any since. I've found a local photographer I want to try, I just need to call her up and try to set up a session. Would love to do it around their birthdays in March! Here's a link to the video from Reagan's Tiny Sparrow Foundation shoot 2.5yrs ago. I just showed this to her nurse the other day for the first time. It's such a beautiful video (if you watch it, make sure you can hear the music, such a neat song as well)...I forgot to mention, the video doesn't come up when I pull it up on my iPhone, just my laptop! Reagan had a good day today. So happy for a quick recovery for my girl. She's still been pretty serious, but content. 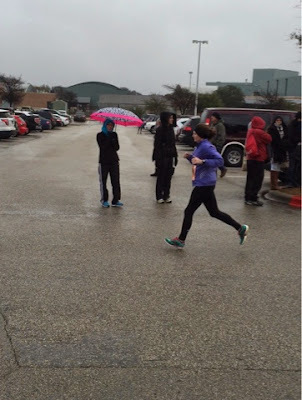 We've gotten a few smiles/laughs out of her but we had to work really hard. Still no weekend nurse, but thanks to Grandma, we did get a lot of cleaning and organization done in Reagan's therapy room! Actually in every room...even her closet looks 1000 times better (it's hard to stay organized when you have so many cute outfits)! Christmas is finally down and put away, so sad, but at least it's done. Tonight Grandma and I even got out to watch Into the Woods! Daddy watched the kids and we went to a showing at Alamo Drafthouse! Loved it. My mom and I saw the musical years ago and we loved the movie version even more! Definitely something I'd like to buy and watch over and over again! 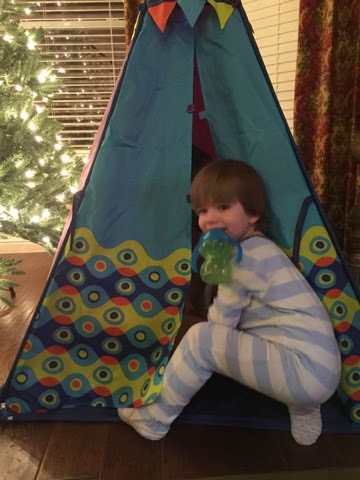 I'll leave you with more pictures of Ryan and the tent he got for Christmas from Zoey's mom Heather! 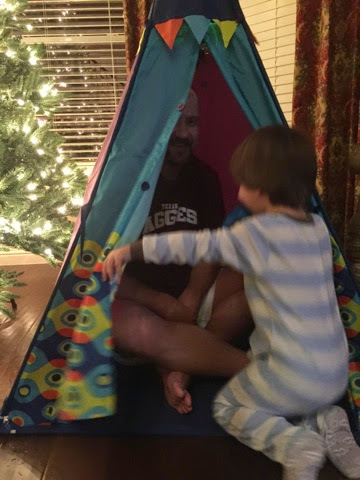 He LOVES it and his new thing is forcing as many people into it at one time! He grabs a hold of your arm or leg and then leads you over to it. 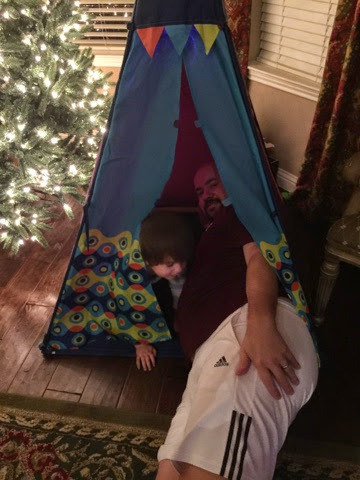 He's climbed in with Daddy, Grandma, Mommy, Mommy and Grandma, Mommy and Daddy...you get the picture (and even though it's definitely not big enough for two adults, we humor him)! But once you're in, he doesn't want to let you out! Reagan had a pretty good day today...all things considered. 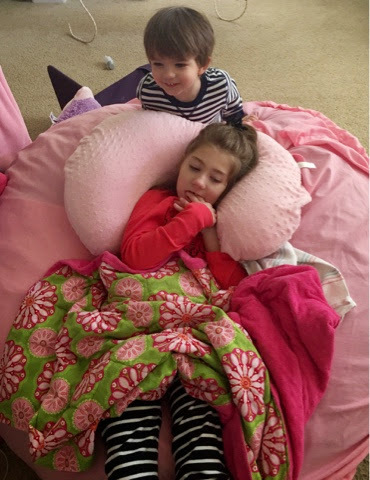 She slept well in her chair last night, but when Mike woke up for work, he heard her pump beeping. Apparently, it had been beeping all night long (and we just never heard it), because there was still a full bag of formula. He got it running again and then laid her in bed where she slept for another couple of hours. When she woke up, she was wide eyed and serious, but not upset anymore. She was very tense today, but OK. She even tolerated a session of speech! Most of the day we just kept it calm and quiet and let her recover from yesterday's drama. Hoping she sleeps well tonight and wakes up feeling even better tomorrow! Today was NOT a good day. Reagan slept last night but woke up very tense and stressed this morning. It was only a matter of time and she was full blown crying! She was bitey and we had to keep her arm restraints on her most of the day. When she was awake (in the morning and early afternoon), she was crying! Thankfully her medication was and we were at least able to get her to fall back to sleep and sleep off the bad. This afternoon she had a longer period of being awake without crying, but she was extremely tense. We held off on giving her any meds for a while but when we did finally try clonidine, it didn't work. Two hours or so later, she finally dozed off on her own and we left her in her chair for the night. Hoping my girl wakes up feeling much improved tomorrow because it was a rough one today! Reagan had another good day today. She woke up a little early, around 5am, but that's better than waking several times during the night! She's been sweet and smiley again today. She did SO well with therapy this morning! She had both speech and OT this morning and she rocked them both! 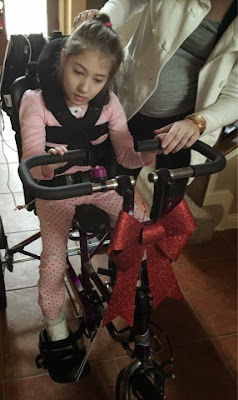 In PT she even worked on standing (without being in the stander)! She's been such a sweetie but right before her nurse left and then again tonight with her brother's craziness, she got a little over stimulated and almost started crying! She settled down though and had a good night. Not really wanting to fall asleep, I finally had to give her clonidine and she dozed off when Daddy laid down with her. Love this girl. Reagan had a good day today. She's been pretty crunchy the last few days and chewing on her fingers a lot, so we've just been trying to keep them away from her as best we can. She's been sweet and snuggly today, lots of cuddling going on. She did have a really great session with her teacher/OT from the school. They worked on waving hi/goodbye and Reagan was apparently waving up a storm! Everyone was really happy with how hard she was working today! Tonight she was great, maybe a little sensitive at times, but overall very good. Brother's hand still looks painful but we're just trying to find a balance in giving him some time with the bandage off as well as trying to keep it covered and protected most of the day. Grandma was not a fan of me posting finger pictures on the blog...just take my word, it's pretty gross! Every time we take the bandage off and Ryan looks at it, he says "Ewwww, YUCK!" Today was a take it easy sort of day. After all of the excitement (good and bad) of yesterday, it was time to just chill. No nurse and all of her therapists canceled, so we all just hung out around the house. Reagan has been good but definitely having bouts of tummy pain. I helped her to go twice today (it had been a week since the last time) and that definitely helped her to feel better! She's been sweet and smiley. Ryan has been great considering. 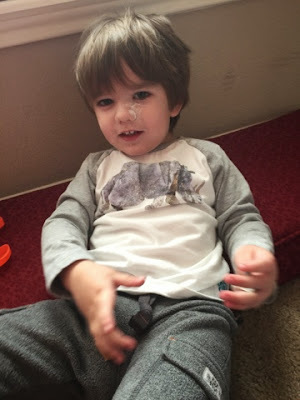 He did pull his bandaid off last night, but has kept it on all day today. It really doesn't seem to be bothering him at all. Poor guy, it looks so painful! It's been quite the day today! 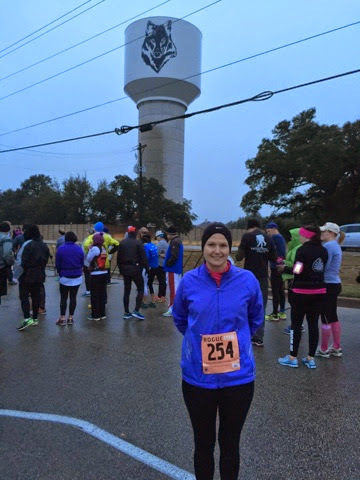 Reagan was up and at 'em at 4am! Of course we went to bed super late last night, so I was really dragging. I had to move her to her chair ,but she did eventually doze back off. Actually, when her nurse got here at 8:30am this morning, she was still asleep! We had a nurse working today because we were going to be auditioning to be on the Family Feud! We've been watching the show for years and always say we should audition, so, when I saw a commercial that they were going to be doing auditions in Austin this weekend, I emailed them and we were given an audition time! We weren't really sure what combination of family members we were going to use, so my mom and my dad both tagged along with the idea that one or the other would watch Ryan while we went through the audition. Thankfully we were able to use my mom. My dad is going to be traveling most of the summer, so he probably wouldn't be available if we were chosen for the show anyway (because they tape during the summer). While we were waiting our turn to go head to head with another family, my dad came to the door to get Ryan's juice and mentioned Ryan had been injured! I just assumed he had tripped or something and was crying and he needed juice to calm him down. Nope. He had actually been taking him up and down the escalator and on the 15th time or so, Ryan was sitting on the step as it approached the bottom and his right pinky finger got mangled! To be perfectly honest, we're lucky he didn't lose his whole hand! So scary! By the time we saw him, my dad had already taken him to the bathroom, washed his hand off (it obviously bled a lot because he had blood all over him), and he was completely calm and just holding his hand up with his pinky extended (I later found out this was about 20min post injury). So we were actually this close to just packing it up and heading straight to the hospital, when my step sister said we were the next family up! So we rushed in and killed it during our head to head (we won both puzzles and just did great all around...despite being shaken up and worried about Ryan)! They called me up afterwards and gave me some paperwork and a business card, I couldn't really hear what she was saying to me because it was so loud in the room with everyone cheering. As we walked out of the room, someone came up to us to tell us how well we did and asked us if we had received a call back...we said no and they seemed really shocked. Well thankfully, I looked down at the paperwork in my hand and realized I was supposed to take this to someone else (it was the producer's business card and our application). They then told us that we were going to go down and meet the shows producer and get filmed by the camera man for the show! We told them that we really needed to do this quickly and if they couldn't get us in right away, we were just going to go to the hospital. Thankfully, a nice family let us have their spot in line and we were able to get right in! They filmed us doing a couple different things and then sent us on our way (we will know get a postcard in 2-3 weeks if we are going to get on the show). So needless to say, the audition went REALLY well, the whole finger disaster did NOT. So we then headed over to Dell Children's hospital, where we spent the rest of the day. We were there probably 4 hrs total. 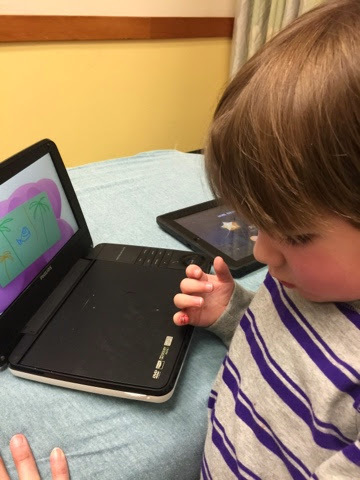 We waited, they did the triage (he freaked out), we waited, they did some x-rays (he freaked out), we waited, they gave him some intranasal sedative (he freaked out), we waited, they soaked his finger in betadine, we waited, then they looked at it and said it was fine and put a bandaid on it and sent us home! There was talk of anesthesia, surgery, a pediatric plastic surgeon, etc...nope, just a bandaid! Again, thank GOD it was not deep and we were able to leave with a bandaid, but that bandaid is going to cost A LOT of money! I did opt out of getting the tetnus shot. Ryan is completely unimmunized (because of Reagan and our fears that vaccines may have caused her seizure disorder), so I was VERY hesitant and I hope and pray that it heals up just fine without any complications! It looks AWFUL, but it doesn't seem to be bothering him too much. He's definitely been a trooper! Reagan was great today as well (and so was her nurse, working way longer than we had originally anticipated today). It's been quite the eventful day, that's for sure! Reagan had a pretty good day today. She's been a little kooky and sleeping off and on. No nurse today, but she did get in some good snuggles from Grandma (and Grandma got quite a bit of gas)! She's been easily excitable (so we have to be careful), but oh what an angel when she's sleeping! Such a sweetie. Love this girl. VERY bitey with those hands! Reagan slept like a rock last night, so much so, she just kept sleeping this morning as well! 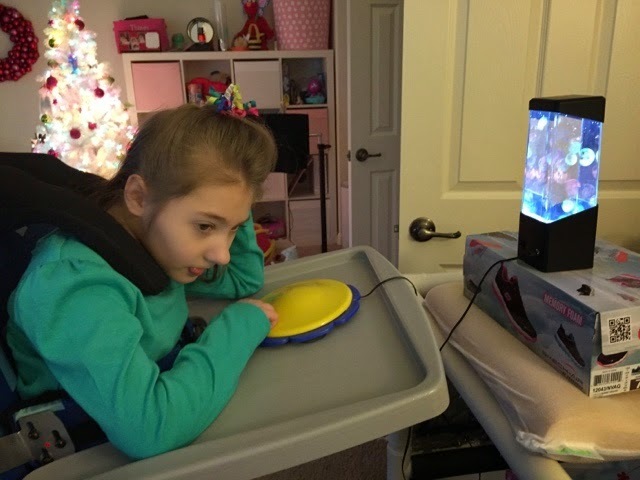 She slept through speech therapy, but her therapist came anyway and worked on making more choice boards for her eyegaze device. We were actually this close to waking her up to get ready for her doctors appt, when she woke on her own at 11:45am! She was smiling from ear to ear, but definitely a crazy sort of smile. We got her dressed and ready to go and she almost fell back to sleep before we left 30min later. She didn't though, not until we got into the car. Her brother did her best to keep her awake, but she dozed off and slept the whole way there and through the entire appt as well. We were just going in to the orthotics place to see about ordering new elbow immobilizers as well as some knee immobilizers for her to use during weight bearing. They actually suggested a different brand than the one we currently use and said that it was something they ordered accidentally 5 yrs ago and loved them so much, they rarely ever order the other ones anymore. I'm very interested in trying them as we've been using the pediwraps brand for years. I'll be sure to post the brand info as soon as we get them as well as a review! Anyway, Reagan slept the entire appt and didn't really wake up until we were unloading her at the next stop...labs for the Stanford EPI-743 study. Her nurse just ran in with her, hoping it would be a quick process, but Reagan woke up super crazy and fought like a mad man and the phlebotomist was unable to even hit the vein! Her nurse came back out and I decided to drag Ryan in with us and give it another go. I had no idea that this lady was incompetent and obvioulsy not capable of hitting a vein. She tried two more times for a total of THREE sticks in my tiny girl's arms...she only got enough to run 2 tests (out of probably 6-8)! Ugh. We'll just wait til her next doctors appt downtown and hope for a much more experience phlebotomist next time! She did eventually settle back down and fall asleep and she slept the whole way home and didn't wake back up til around 7:30pm. She woke a little kooky though and kept escalating until she was almost in tears! 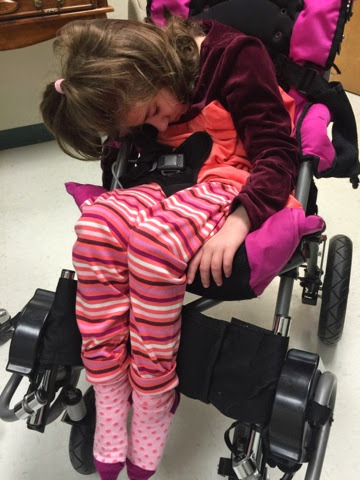 A dose of oxycodone helped to settle her down and she fell back to sleep. Not really sure what's going on with her right now. It seems like she's fighting bad days...I sure hope she wins! Please keep my girl in your prayers! Reagan had another rough start to the day today. She slept til 2am this morning, then woke up fussing. I moved her to her chair again and she calmed down right away. I didn't have to give her anything and I'm pretty sure she dozed back off and slept for a few more hours. 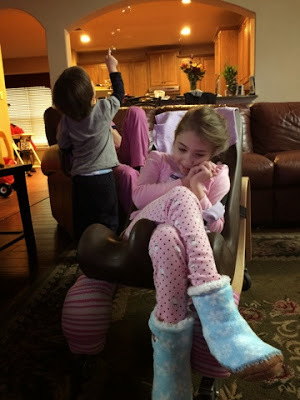 But this morning when she woke up, we all gathered round and she was NOT happy. We were getting the big lip/frowny face and she was this close to tears! She settled down though (we're pretty sure it was tummy pain), and then she was fine the rest of the day! She had OT and school today and did really well with both. 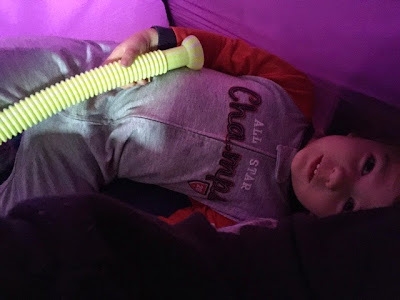 There were a couple times where a particular toy or activity would get her a little too excited and we'd just have to back off a bit and then she'd settle down. Tonight she hung out with her nurse while we went to Bible study and all was good. She dozed off on her own while watching basketball with Daddy (who can blame her) around 10:30! All things considered, it turned out to be another surprisingly good day for my girl! 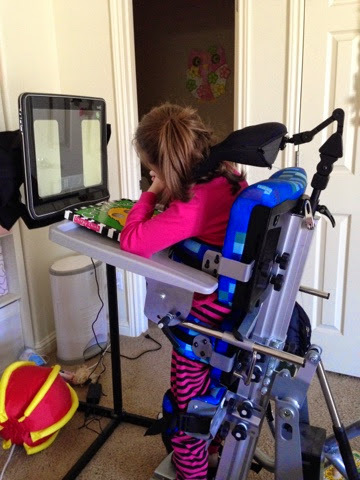 Working with her eyegaze computer in her stander! Reagan woke up this morning around 4am crying! I jumped up, moved her to her chair, and gave her a dose of oxycodone. Thankfully she settled down and fell back to sleep. When she woke back up, she was fine! She's actually had a really good day today. She had speech this morning and continues to do well with the four choice board (only two of which are real choices at this point). 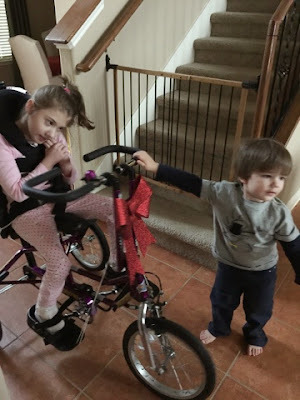 Then she had PT and we brought her downstairs and tried out her new tricycle! It took us a while, but we eventually got most of the necessary adjustments made. We are going to have to get smaller foot plates though. She has smaller than average feet and there's just no keeping her feet in those pedals even with the straps on! We were also missing the gloves (the ones that help to keep her hands on the handle bars)...so a few things we need to get ironed out, but otherwise she looked good in it. Ryan got a little jealous with her being on it, or maybe it was just all of the attention she was getting! Afterward, we blew some bubbles for both of them and Ryan was having a blast with that. Tonight I'm definitely smelling bad day smell on her. I'm not sure if she's fighting them off or what, but hopefully we can continue this good streak! Reagan slept well last night and woke up super sweet. She's had a great day today. Very laid back, less kooky and just sweet. She had a make-up session of PT and then school/vision in the afternoon (and did really great with that). This afternoon we got in a sample of Jamberry nail wraps. A blogging friend of mine (Lily's mom) has been selling these and I've been dying to try them on Reagan. They come in so many cute designs and last a long time, they are perfect to try on her little toes! We did one on her big toe and one on our nurse's finger! I think they turned out super cute! We'll definitely be ordering some of these for my girl! Tonight she was a little more sensitive and just slightly off. I can't really put my finger on it. She started kicking around a little more and seemed like her tummy might be hurting her. I picked her up and held her and she had a poo (maybe that's what was bothering her). She's definitely been more calm while I'm holding her and she fell asleep in my arms (as I was dozing off myself). Hoping for another good night's sleep for my girl! It's been a good, albeit slightly kooky day for my girl. She's been sleeping well and waking up smiley. While pretty relaxed in her body, she's been a little vocal/kooky. She had speech, PT, and OT today and did well with them all (spent some time in her stander working with her switches). 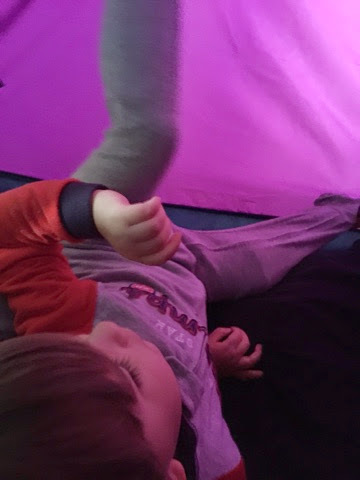 We're still nurseless, so I've been wrangling both kiddos all day, but we're making it work (my back has been killing me though, and I'm guessing the increased lifting is the culprit). Looking forward to a good week for my girl! Reagan had a good day today. She woke up early...according to Mike she woke up at 6:30am when I left to take my running partner to the race I signed up for but couldn't run because of my injury! When I got home around 8:30am, both kiddos were happy and watching cartoons. Reagan's been in a good mood all day. Pretty laid back and still. No nurse and no grandma this weekend (she's having flu-like symptoms but should be good by next weekend). Just a lazy sort of day! 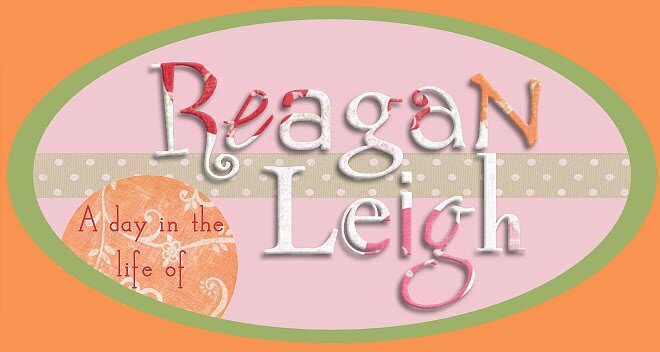 Reagan slept well last night and woke up this morning feeling MUCH better (thank God)!! 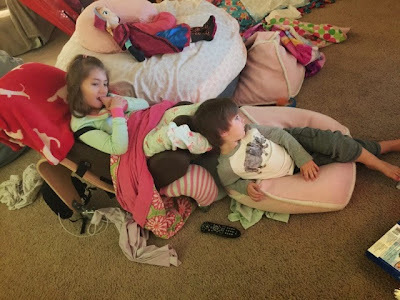 She was soaked all the way through her diaper requiring an immediate diaper/clothes change (and we even had to switch out her chair because there was a puddle on that as well), but she was so calm and patient with everything. Such a good girl. This morning she was a little more scowly/frowny, but as the day has gone on, she's just been serious but content. I'll take that any day! We honestly couldn't have hoped for any better. So thankful for this quick recovery for my girl. Today we finally broke out her bicycle from it's crate/box in the garage. We still haven't gotten her on it, just checked it out. Ryan liked the looks of it and wanted to mess with everything on it! That boy is trouble! 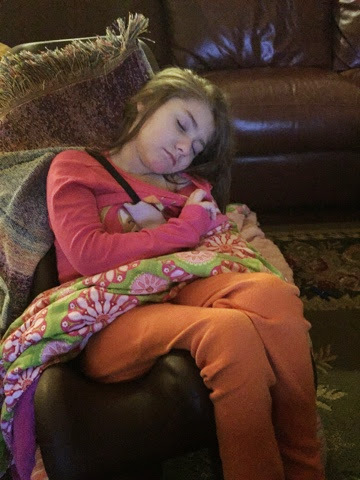 Tonight Reagan dozed off in her chair and she was OUT. I mean, like OUT out! I picked her up and her head just dropped back like a limp noodle. Hopefully that means she's in for a restful night's sleep tonight! Reagan slept all through the night last night, until 5am when she woke up crying! Big time, inconsolable crying. Moving her to her chair and a dose of Lortab later, she finally dozed back off. She's been super miserable all day today. Definitely a BAD day. We've had to keep her arm restraints on all day. She's been very upset and very bitey when awake. Thankfully, she's slept off and on all day. When she's awake, she's miserable. She was slightly better tonight, there were stretches of time when she was awake and not crying, but you still couldn't interact with her at all (that only made her more upset). Right this second she's asleep and I'm praying she'll stay that way! It's been two weeks since her last bad streak, hoping this one is over and done with in just one day! Thank you for keeping our girl in your prayers! Today was a great day for my girl! She slept a little better. She didn't wake us up til 4am, so hopefully she slept until then. But after that, she was WIDE awake! Very sweet and smiley though. Still wanting her hand constantly, but so cute. 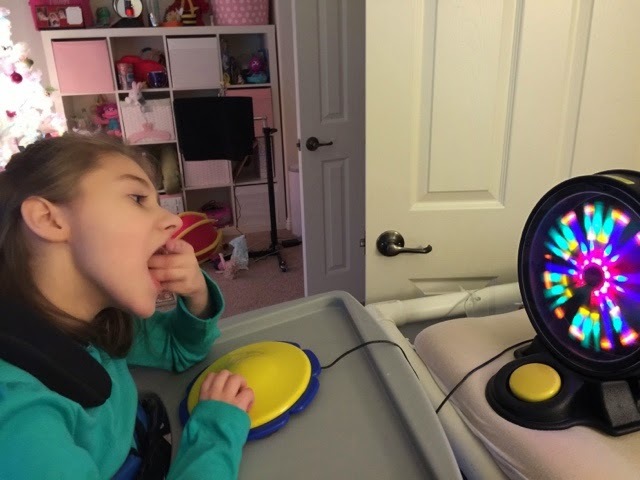 She had speech this morning and did well with it...her therapist changed the choice board on her eyegaze to 4 choices (instead of 2) and she was making choices no problem! 4 choices is a little more tricky in that it forces her to look up (or down) and to the right or left (looking up is a little more difficult for her). Of course, two of the boxes were empty (just to simplify everything visually), but she'll eventually work up to 4 full pictures. This afternoon we went in for a tube change. I'm not sure if it's from all of the crunching in half (and tightened tummy muscles) or what, but her tube has been leaking a lot the last couple days. 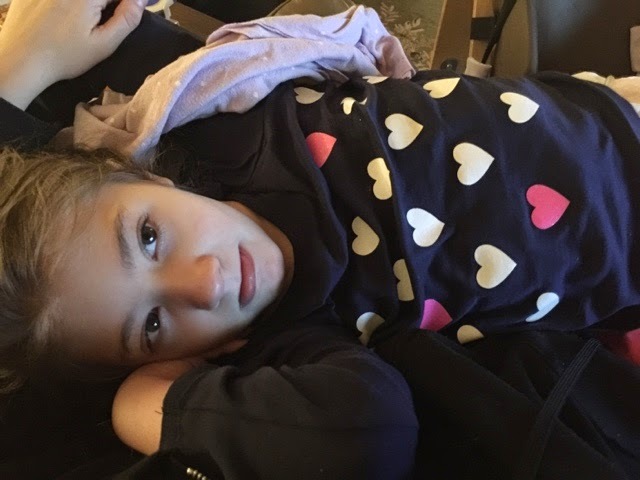 In the last few weeks, we've noticed it being a little more leaky, especially when laying on her tummy or when picking her up and carrying her (and putting pressure on it). It was time for a change anyway (it'll be 4 months on the 11th), but I had it scheduled for next week and went ahead and just called them and asked to move it up. We went through 3 shirts yesterday afternoon alone! It was a great day for it though because this girl has been beyond precious! 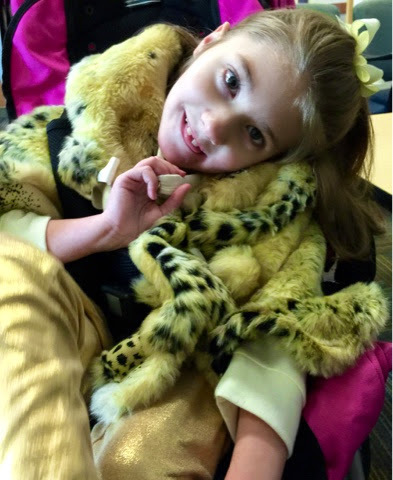 She was rocking a new Christmas outfit from Grandma (and a diva coat our sweet neighbor gave us years ago) and we did a mini photo shoot in the waiting room. 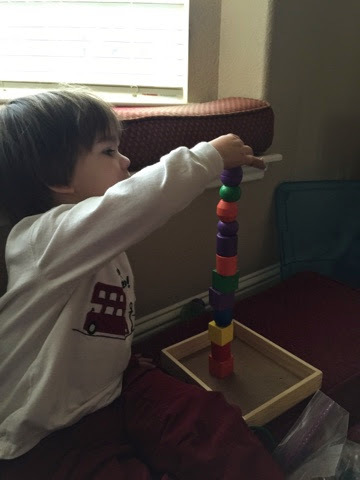 The doctor/radiologist that changed out her tube was not the most skilled, but nevertheless, he got the job done. Her old tube really didn't want to come out, but he eventually eased it out and other than a few winces, Reagan never made a peep! 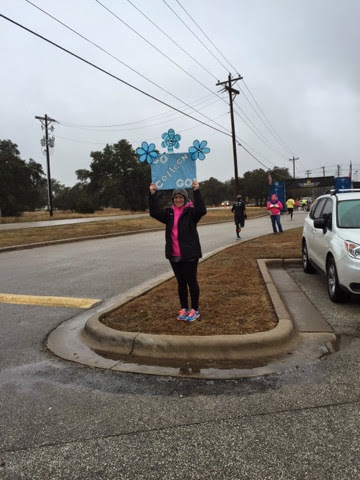 Such a trooper! Then it was straight home for a joint session of vision/school/speech! She did great with them all! Last night she was still just as smiley and sweet as can be. Hoping tonight is the night for sleep! Sleep at last! Reagan finally had a full night's sleep last night! She woke up this morning sweet and smiley and great! She's had a good day today. Looked a little groggy much of the day, but never fell asleep til later. Not much going on. Her teacher came at 1 and she did well with that. Then this afternoon right around 5pm, she finally dozed off. And she was OUT! Mike and I went on a rare date night because Bible study was canceled so we had childcare already lined up! Ryan hung out with Grandpa (or as he's currently saying, peepaw) and Reagan's night nurse was here keeping an eye on her! Reagan never woke up, she'd move and stretch, but she stayed asleep. After we got home, Mike transferred her into her bed no problem. Looks like it's going to be another good night's sleep tonight (fingers crossed)! Last night was another rough night. My girl keeps waking at 1:30am fussing and I have to move her to her chair! It's beginning to feel like Groundhog day! I guess if we weren't going to bed after midnight each night, it wouldn't be so bad, but we are! Ugh. Very tiring! She's been good during the day though! We weren't sure what to expect, but she's been a sweet smiley girl. She did great with OT today and even tolerated her stander! We've been noticing a lot of gas, but no poos lately (we thought maybe some upright time would help). It's feast or famine with this girl! Tonight she's been sweet and snuggly, albeit spitty. Her poor face is all red and chapped from having her hands in her mouth and then the spit on her cheek/chin that follows. We're trying our best to keep them away, but she's very crunchy and into her hands right now. Hoping for some sleep tonight (for all of us)!! Last night was another restless one. I don't think Reagan got much sleep at all. We started her off in her bed, but she kept waking back up agitated, flailing, and pulling her hair. 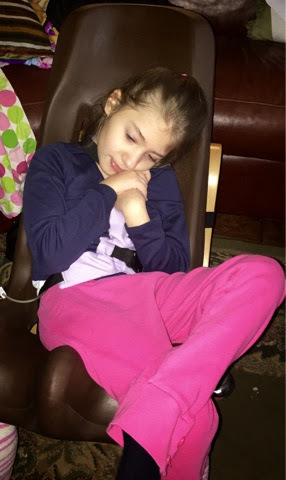 We eventually gave up trying to soothe her in bed and moved her to her chair, putting both arm restraints on her. 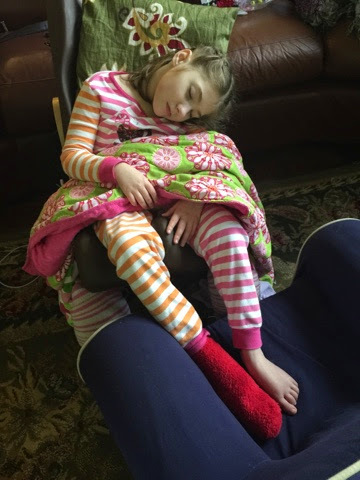 We tried both clonidine and Lortab, nothing really seemed to work to help her settle down or fall asleep! She continued to be very vocal and we just tried to get some sleep. We got up periodically to check on her and try to settle her down, but I'm not sure how much, if any, sleep she got. She did take a little cat nap this morning, but only for 15-20min and then the vocalizations started back up. I gave her some time off from the restraints, but immediately the fingers go back in the mouth and down the throat! (And her poor cheeks and chin are bright red from it all!) I'm not sure if this is a mild form of "bad days" or if we're just heading that direction? Her tummy is definitely part of the problem, as I've been witnessing quite a bit of gas the last couple days (especially when we pick her up and her tummy crunches in half)! 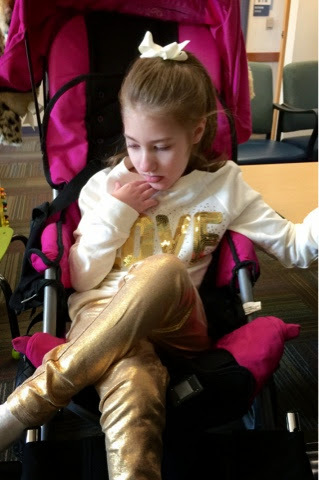 She did a great job of tolerating speech and OT today (and even spent some time in the stander)! 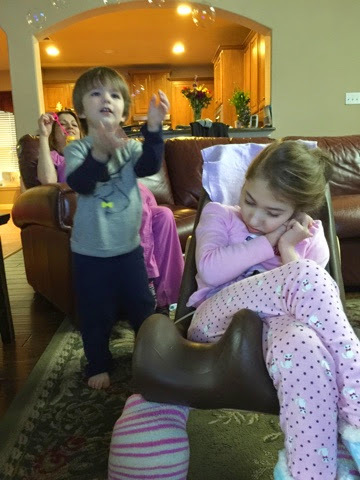 And she also was great tolerating her brother (no nurse=a lot more brother time). Tonight she's been super spitty and sticking her tongue out a lot (and biting that lower lip)...I'm hoping that settles down and she can get some sleep! It was a very restless night for my girl! She tossed and turned and was very vocal, but every time I got up to check on her, her eyes were still closed! I think she slept, it was just a very restless sleep (for all of us)! This morning she woke with a smile still on her face and she's been smiling ever since. Very vocal and kooky today. Fighting to keep that hand in her mouth. She was still a little groggy this morning (I wonder why) and took a nice little nap and then another again this afternoon in my lap! She was getting very vocal so I picked her up and held her and she fell asleep and took a nice little nap with Mommy. No nurse this weekend or Monday. Our Sat-Mon nurse no longer wanted to work weekends, so until the agency finds a replacement, we're nurseless. Reagan's still a little snorty/congested sounding and both Mike and Ryan have been sneezing, hopefully it's just allergies! Tonight she's continued to be very vocal (on edge sort of vocal) so I picked her up and held her and again she fell asleep in my arms. She's OUT out, so hopefully she makes the transition to bed! Hoping for a better night's sleep tonight for my girl. Reagan had a very sleepy day today. 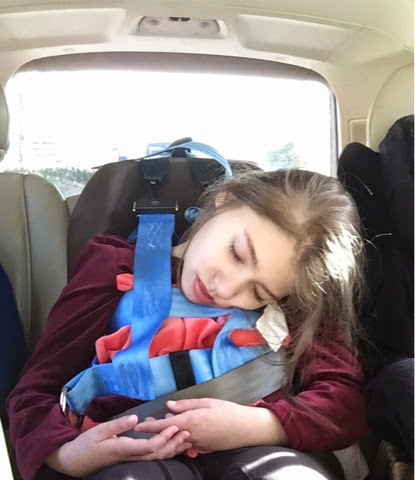 In total, she probably wasn't awake longer than an hour all day long (that's total time combined throughout the day)! When she was awake, we did see a kookier side of her than we've seen in a while. Definitely more tense and super vocal, but she didn't stay awake long. We're not really sure what to expect of this as she's been hard to read lately (and impossible to predict). Hoping she holds on and continues these longer good streaks! Reagan was a little restless last night. She went to sleep before midnight, but was still opening and closing her eyes off and on. Around 3:45am she woke up crying and I gave her a dose of Lortab and Mike laid down with her. She went back to sleep until 5:30am when we found her completely turned sideways in her bed and wide awake! She was calm though, so I changed her and put her in her chair. She did doze back off again, but I'm not sure for how long. This morning she was sweet and calm but slightly more sensitive and did not tolerate music on tv (the spongebob theme song) or her brother's antics (playing with every noisy toy he can find in her room)! I spent the morning upstairs with her (since we were nurseless today) and Ryan stayed downstairs with Daddy. Eventually Reagan dozed back off and slept for a while, but when she woke up, we brought her downstairs and she's been watching football with us ever since! Super sweet and snuggly, I've gotten my share of cuddles today from this sweet girl. And even though she's kicking around a little more and putting her hands in her mouth occasionally, she's still very loosey goosey and when you hold her she just melts into you! A little congested and breathing loudly, but otherwise good! I sure hope we can all avoid the Flu and assorted viruses that seem to be getting everyone sick right now!